A fantastic looking and sounding set of microphones that could be a long lasting starter set for a budding studio engineer or a workhorse set for a professional performing musician. Excellent value for money. Nice features, e.g. swivel joint and quick release. Great sound. Shure is a name that has been synonymous with quality microphones for many years, with the SM57 and SM58 in particular often recognised as the industry standard for snare and vocal mics respectively. The Shure PG Alta microphone range is designed as a more accessible option for live and studio use than the original Beta series. The Alta family boasts a microphone for every occasion, from vocals to a range of instrument and drum applications. The PGA drum kit sets are available in the UK as a four-piece set (kick, snare and two toms), and the newer 'PGADrumKit6' - kick, snare, two toms and an overhead pair. This six-piece set is perfect for close-miking a four-piece drum kit. Each microphone set is supplied with a PGA52 for kick drum, PGA57 for snare, PGA56s for toms (all cardioid dynamic) and a pair of phantom powered PGA81 cardioid condensers for use as overheads (six and seven-piece sets only). "The swivel joint and quick-release latch are welcome features and work not only practically, but are aesthetically pleasing too"
In terms of frequency response across the board, this collection should be more than enough for everyday live and studio use. Some of you may recognise the familiar titles borrowed from the Shure Beta range. For instance, the PGA52 is paralleled with the original Beta 52A kick mic, while the PGA57 is comparable to the Beta 57A or the famed SM57. 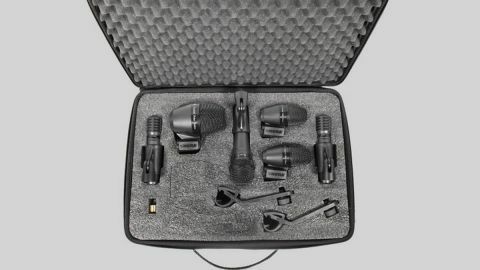 The bundle comes complete with a soft carry case, drum mount clips for the PGA56s, a 4.6m XLR to XLR cable for each mic and a thread adaptor for the PGA52 (for connection directly to a mic stand). Unfortunately there are no clips or stand adaptors supplied for any of the other mics, although happily, they should be compatible with any generic stand. Each mic is finished in metallic black with a matching grille for, as Shure puts it, an "unobtrusive visual presence". In plain English, they really do look quite fantastic. The kick and tom mics are fitted with a new 'swivel joint and quick-release latch' system. This means the mic can be screwed directly into a stand or clip, rotated and secured in place using the bicycle-style quick release mechanism. Shure reckons this makes for extremely quick and easy positioning. First out of the box comes the sleek and lightweight carry case accompanied by the six included XLR cables - a welcome addition for a 'plug and play'-type set of this nature. The box also includes velcro cable ties for the XLRs and of course an instruction booklet containing not only tech spec, but also some handy tips on best practices for miking your kit. With the case unzipped it is clear to see that ample protection is offered for each microphone; snugly supported by the dense polyethylene foam. This will unquestionably allow them to stand up to the inevitable knocks and scrapes of life on the road. The mics themselves feel reassuringly weighty and the metallic black gives them an elegant appearance. Setting up the mics with today's kit of choice, a Tama Starclassic Bubinga, is easily accomplished. Starting by securing the '56s to the toms using the supplied rim mounts it becomes apparent that the adjustability options of these clips are ample; allowing the mic to be positioned not only at the desired angles, but also permitting a varied choice of distance from the playing surface. The mounts also feel incredibly sturdy when clamped to the die-cast hoops of the toms with no signs of movement whatsoever. The swivel joint and quick-release latch are welcome features and work not only practically, but are aesthetically pleasing too. As previously mentioned, all other mics in the set require external stands or mounts which will increase the overall price slightly. So at the very least, the addition of a snare clip for the '57 would be a useful move. With the mics on stage, set up and ready to be soundchecked, the kick is of course the first to be put to the test. It is immediately noticeable that the mic is quite high gain, meaning the trim control on the desk was left relatively low. Although perhaps naturally lacking the low-end frequency response (50Hz compared with a more common 20Hz), a quick boost of the low frequencies establishes a full and meaty attack from the bass drum. The '56s are equally as punchy and bring the low end out of the toms like an absolute dream. The 16" bubinga floor tom is especially well represented by the neat little dynamic mic, thudding through the subwoofer with every strike. All in all, each microphone is as advertised and gives a great sound not only front-of-house but through the in-ear monitor mix. A great all-round set of microphones that will leave you with a range of recording options not just for drum kit, but for the whole band. This is professional quality gear that we have come to expect from Shure, at a very reasonable price.